Hi. I have a Broadcom BCM43142 wifi wifi card on a Lenovo laptop. Wifi does not work with attached drivers ((b43, broadcom-wl, broadcom-wl-dkms).) I need (I think) STA driver (as shown in the attached image). 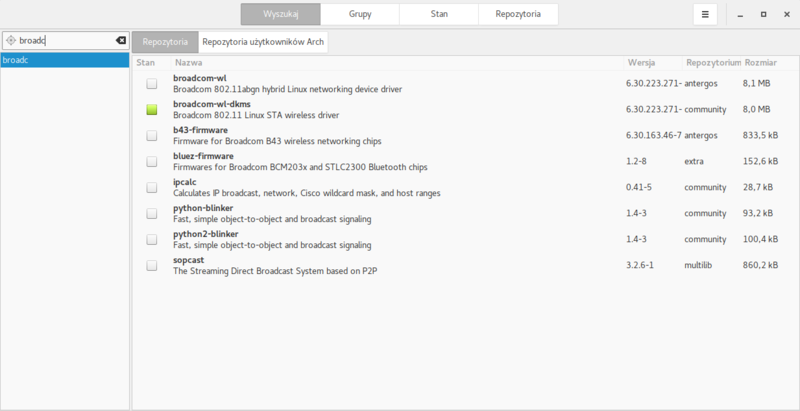 The picture comes from Manjaro, which by default has these drivers and my wifi card works fine on these drivers. Please help how to install this driver on my Antergos. I’m a beginner, I use Antegros live CD. @judd thx! Antergos works great! i had a message saying that the driver wl wasn’t found. Hi. Back to the topic. The default drivers do not work when booting from a live CD. However, after installing Antergos on the hard drive everything works beautifully with default broadcom-wl drivers. The default drivers do not work when booting from a live CD.